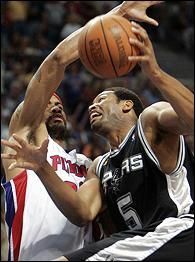 Somebody needs to go through Robert Horry’s playoff games, pluck out all the big plays and shots, then run them in sequence for like 10 straight minutes with one of those cool sports video songs playing (like Aerosmith’s “Dream On,” or Led Zeppelin’s “The Rain Song”). Who wouldn’t enjoy that? I bet Horry has made at least 20 to 25 humongous shots over the years. Seriously. You might be asking yourself, “Wait, that opening paragraph sounded a little familiar.” Well, it should. I wrote it two summers ago. it would almost demean what happened to write something like “some huge 3-pointers” or “a number of game-saving plays.” Considering the situation (a budding Spurs collapse that seemed eerily reminiscent of the 2004 Lakers series), the circumstances (nobody else on his team was stepping up) and the opponent (one of the best defensive teams ever, playing at home), Horry’s Game 5 ranks alongside MJ’s Game 6 in 1998, Worthy’s Game 7 in 1988, Frazier’s Game 7 in 1970 and every other clutch Finals performance over the years. 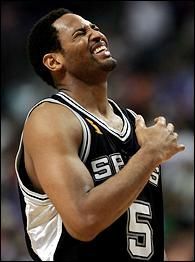 If Horry hadn’t scored 21 of his team’s last 35 points, the Spurs would have been “Dead Man Walking” heading back to San Antonio. Instead, they’re probably going to win the title Tuesday night. My favorite thing about Sunday night’s game: When Horry drained that go-ahead three at the end of the third quarter, it was like sitting at a poker table with a good player who plays possum for an hour, then suddenly pushes a stack of chips into the middle. Uh-oh. He’s making his move. You could just see it coming. The rest of the game played out like that  the Spurs always one mistake from blowing the game, Horry bailing them out again and again. By the time he jammed home that astounding lefty dunk in overtime, everyone knew the game would somehow end up in Horry’s hands. Well, everyone but Rasheed Wallace. Horry’s career has always been a nice litmus test for the question, “Do you understand the game of basketball or not?” Nearly all of his strengths aren’t things that casual fans would notice. He’s the kind of guy who would be useless on the “And 1” tour. For instance, he’s a terrific help defender who constantly covers for his teammates. He’s big enough to handle power forwards and quick enough to handle small forwards. He picks his spots and only asserts himself in big situations when his team truly needs him. He doesn’t care about stats or touches  at all  which gives him something in common with maybe 2 percent of the league. And he gets better when it matters. What more would you want from a supporting player? and you didn’t have to deal with any of the superstar BS? Have a great game, everyone notices you. Have a terrible game, nobody notices you. And that’s your life. Doesn’t that sound like the ultimate gig? In a league loaded with guys who believe they’re better than they actually are, Horry understands his own strengths and limitations better than anyone. That’s what makes him so great. And that’s why I like the poker analogy for him. He’s the guy sitting at the table with a towering stack of chips, the guy who never chases a bad hand, the guy who makes your heart pound when he’s staring you down. You never remember the hands he lost, but you always remember the ones he won. And when he finally cashes out and gets up from the table, you hope you never have to see him again.